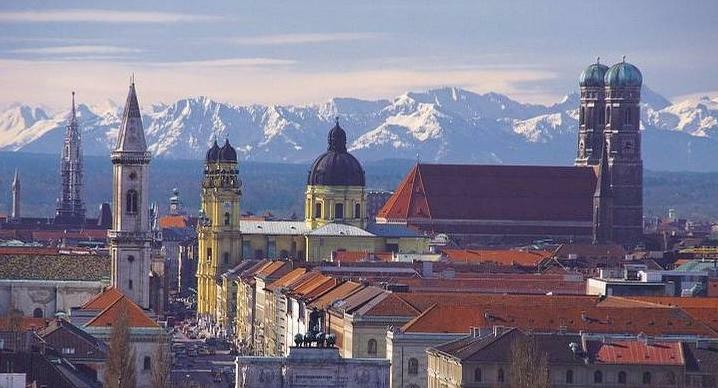 Munich (founded 1158) is the capital of the German state of Bavaria and Germany's third largest city. It is located in south-eastern Germany on the river Isar, north of the Alps and near the border to Austria. Information about the city and sightseeing destinations in Munich can be found at www.munich.de. Located just 80 km north of the Alps, Munich also offers various opportunities for sport activities in the mountains. (© Picture courtesy of munich-business-school.de). Marienplatz is the central square in the heart of Munich. Marienplatz houses the Mariensäule, the Marian Column topped with the golden statue of Virgin Mary, and it is also home to the Old and the New Town Hall of Munich. The tower of the New Town Hall houses the Glockenspiel, a beautiful carillon that is over 100 years old. Come here at 11 a.m. or noon to hear the Glockenspiel chime and watch the 32 life-sized figures reenact historical Bavarian events. Look out for the golden bird that chirps 3 times to mark the end of each show. Further details including how to get there and admission fees. At the edge of Munich's old town lies the Residence, the former royal palace of the Bavarian monarchs. Today the Residence houses one of the best European museums of interior decoration. The Residence, whose first buildings were constructed in 1385, consists of ten courtyards and beautiful historical gardens. The museum itself displays 130 rooms with antique furniture, art, porcelain, and tapestries that span the Renaissance, Baroque, Rococo, and the neoclassical era. Further details including how to get there and admission fees. The Catholic Cathedral of Our Blessed Lady is the landmark of Munich and the city's largest church; it holds up to 20,000 people. Together with the Town Hall, the sturdy twin towers of the Cathedral shape Munich's skyline and make it a great point of orientation. You can also climb the steps of the towers - the view of Munich's cityscape and the Bavarian Alps is breathtaking. The architectural style of the brick-built cathedral is late Gothic from the 15th century. Its famous domes atop each tower were modeled on the Dome of the Rock in Jerusalem. Further details including how to get there and admission fees. The Alte Pinakothek is one of the oldest art galleries in the world and home to over 800 European masterpieces from the Middle Ages to the end of the Rococo. You can see one of the biggest Rubens collections here. The Neue Pinakothek features art and sculpture from the late 18th to the beginning of the 20th century. Highlights include German art of the 19th century, such as paintings from Caspar David Friedrich, and a wonderful collection of French impressionists. The Pinakothek der Moderne is the largest museum for modern art in Germany and spotlights art of the 20th century, including photography and video. Further details including how to get there and admission fees. Just a few blocks northeast of the Munich Residence is the English Garden, Munich's largest park. Bigger than Central Park in New York, this green oasis is a wonderful place to explore: Rent a paddle boat, stroll along the wooded paths, visit one of its traditional beer gardens, and watch the German answer to surfing on the currents of the waterway called Eisbach. Further details including how to get there and admission fees. This stadium was the site of the 1972 Summer Olympics, and its design was revolutionary and futuristic for its time: The sweeping and transparent canopies of acrylic glass that were modeled on the Alps are the signature characteristic of the Olympic Stadium. Further details including how to get there and admission fees. One of the most beautiful examples of baroque architecture and an absolute must for very visitor of Munich. The architect Barelli build this summer residence west of the city center in the 17th century. The spacious Great Hall ("Steinerner Saal") was decorated in the Rococo style by Johann Baptist Zimmermann and Francois Cuvillies the Elder. A famous feature of the palace is the "Gallery of Beauties" - the most beautiful women of Munich (at that time) painted for King Ludwig I. Further details including how to get there and admission fees. The German Museum is located on an island in the river Isar that runs through Munich's city center. It is one of the oldest and largest science and technology museums in the world and boasts an impressive collection of historic artifacts. You can see the first electric dynamo, the first automobile, and the laboratory bench where the atom was first split. Other highlights of the museum include exhibitions on astronomy (top floor; newly established in 2009), transportation, mining, printing, and photography. Further details including how to get there and admission fees. The Glyptothek was erected under King Ludwig I from 1816 to 1830. It was designed by Leo von Klenze as a temple complex in a Greek-Ionic style. Badly damaged in 1944, the Glyptothek was restored and reopened in 1972. The exhibition presents the history of Antique sculpture between 600 BC and 400 AD, showing famous originals. The gable sculptures of the late Archaic Aphaia Temple in Egina are the museum's most precious pieces (around 490 BC). Further details including how to get there and admission fees. No trip to Munich is complete without a visit to the most famous beer hall in the world, the Hofbräuhaus. The Hofbräuhaus brewery was built in 1589, and in the surface of the long wooden tables, you can spot names, comments, and dates that were engraved more than 100 years ago. Further details including how to get there and admission fees. Bavaria Film Studios is the place where "Das Boot" was shot, as well as many successful German films and TV series. The stunt show with its special effects is exciting entertainment for the whole family, children can have a ride on the dragon "Fuchur" from the "Neverending Story", while parents might be more interested in a walk around in the submarine of "Das Boot". Guided tours take about 90 minutes, and since you'll be walking inside the studios as well as outside, you should bring comfortable shoes and, should the weather demand it, wateproofs. Further details including how to get there and admission fees. A must for soccer fans: the Allianz Arena was constructed for the 2006 Soccer World Cup. It was designed purely as a football stadium and took less than three years to build. It is home ground for FC Bayern Munich and TSV 1860 Munich. A visit is only possible through a guided tour, which includes a stop in the fan shop. Further details including how to get there and admission fees. The concentration camp of Dachau, 15 km northwest of Munich, was one of the first concentration camps in Nazi Germany and served as a model for all subsequent camps in the Third Reich. Dachau visitors follow the "path of the prisoner", walking the same way prisoners were forced to after their arrival in the camp. You will see the original prisoner baths, barracks, courtyards, and the crematorium, as well as an extensive exhibition and various memorials. Further details including how to get there and admission fees. Neuschwanstein Castle, royal palace in the Bavarian Alps, the most famous of three royal palaces built for Ludwig II of Bavaria, sometimes referred to as Mad King Ludwig, who grew up nearby at Hohenschwangau Castle. Begun in 1869 and left unfinished at Ludwig's death in 1886, the castle is the embodiment of 19th century romanticism. In a fantastical imitation of a medieval castle, Neuschwanstein is set with towers and spires and is spectacularly sited on a high point over the Pöllat River gorge. Neuschwanstein is one of the most popular of all the palaces and castles in Europe. About 1.3 million people visit "the castle of the fairy-tale king" every year. Note, that until the end of 2012, a part of the castle is covered due to reconstruction on the South Wing. If you want to join the crowd: Further details including how to get there and admission fees. After visiting Versailles, Ludwig II (who was crowned king in 1864) set out to create a Bavarian counterpart. Between 1868 and 1869, the architect Georg Dollmann drafted seven plans for the new palace in Linderhof, but none were implemented. Finally, in 1870, the Versailles project was relocated to the island of Herrenchiemsee. In Linderhof, instead, Ludwig II commissioned a "King's Cottage". By 1878, in spite of difficult transport routes and a virtually inaccessible location, the palace was completed, and the rooms decorated in the style of the "Second Rococo". The development of the park, designed by Carl von Effner, took from 1870 to 1880. Several architectural features were added at the king's request. Further details including how to get there and admission fees. The lake Starnberger See is located about 25 km southwest of Munich. With its surface area of approximately 56 square kilometres it is the fourth largest lake in Germany. Further details including how to get there and what to see. The Chiemsee is located about 50 km south-east of Munich. It is a very popular holiday destination and choice for day excursions for Germans, but is relatively little known in the English-speaking world. Beyond sports and leisure, its main attraction is the castle of Herrenchiemsee built by Ludwig II of Bavaria (the 19th century ruler behind the more popular Neuschwanstein and Linderhof castles). Further details including how to get there and what to see. Freising, about 30 km north of Munich (and easily reachable with the S-Bahn), is the oldest town between Regensburg in northern Bavaria and Bolzano in South Tyrol. lt has been the seat of bishops since 739 and developed into a cultural and spiritual centre in Bavaria, long before the ducal towns ot Munich and Landshut. Many historic buildings and works of art serve as reminders ot its rich and important cultural past. The most outstanding sight in Freising is the Mariendom (St Mary's Cathedral) which was consecrated in 1250. The original building of this romanesque basilica had been destroyed by fire in 1159. The cathedral was the first brick structure to be built north of the Alps since ancient times. After the decline of the Roman Empire this method ot construction had sunk into oblivion. The tomb of St. Korbinian, the patron samt of the bishopric, is located in the crypt ot the cathedral. In the centre ot this four-nave crypt you can see one of the most distinguished sculptures in Europe carved out ot stone in the high Middle Ages: the so called Bestiensäule (the column of beasts). Between 1020 to 1803 the Weihenstephan hill served as the seat of a Benedictine monastery. Due to secularization, the church and convent were demolished in 1811. The only remains are the eastern wing and the hall in the southern wing of the building with a hall decorated with frescos by Hans Georg Asam. Nowadays Weihenstephan is known for housing the oldest brewery in the world. Further details of Freising and the Weihenstephan Brewery including how to get there and what to see. The Schleissheim Palace (German: Schloss Schleißheim) actually comprises three palaces in a grand baroque park in the village of Oberschleißheim near Munich. The palace was the summer residence of the rulers of Bavaria. The airfield and its historic buildings were constructed between 1912 and 1919 by the Königlich-Bayerische Fliegertruppen (Royal Bavarian Flying Corps). In the early 1990s the historic maintenance hangar was restored and enlarged with a new exhibition hall and a restoration workshop. The Flugwerft Schleissheim complements the big aerospace exhibitions in the main museum in Munich. Further details of castle and the air field including how to get there and what to see. Founded 2,000 years ago by the Romans, Augsburg is one of Europe’s oldest cities and was a key settlement of the Roman Empire. As such, its long and fascinating history has placed it at the center of major European events for the past two millennia. From more recent times, the Fuggerei is famous beyond Augsburg, being the world’s oldest social housing complex. Further details including how to get there and what to see. Sun, May 6: Auer Dult: For friends of Munich's Oktoberfest this is a must: its the spring counterpart of the famous 2-week event in autumn. If closes on May 6, and takes place at Mariahilfplatz (south of the Deutsches Musuem, on the other side of the river Isar). See the May Dult page for more details, including a map. Opening hours are 10:00 a.m. to 8:00 p.m.
Tue, May 8, 20:00: Gasteig, Black Box: Special concert organized for GRB2012 participants (a flyer is in your conference package). Tickets available either at Gasteig starting 1 hr before the start of the concert, or pre-booking at MuenchenTicket. The concert is open for the public, so may sell out quickly - we've made NO reservations for you. Golden Dragons: 25 textile master pieces from China and Tibet, about 500 yrs old, from a private collection; never shown before: Special exhibition in the Völkerkundemuseum (Munich State Museum of Ethnology; 2nd largest in Germany after Berlin). Open: Tuesday - Sunday 9.30 a.m. - 5.15 p.m.
Libanese cousine. Don't miss the arabesks in the basement room! Restaurants Zum blinden Engel or Vinorant Alter Hof: Dinner in the Dark. Concentrate on your taste, while you don't see what you eat. Best with your partner. Revolving Restaurant on the Olympia Tower, 181 m above Munich. Best on a cloudless day/night.